1000ft Spider Web Engulfs Greek Lagoon Edge - Its A Strange World. A long stretch of plant life on the edge of Aitoliko Lagoon in Greece has been spectacularly covered in a large mass of spider web. While it may be someone’s worst nightmare, the stunning act of nature was recently caught on film by a local photographer called Giannis Giannakopoulos. He too, was stunned by the sight of the webs, labelling it strange and unprecedented. Experts have noted that the webs are created by an arachnid species known as Tetragnatha, and number in the thousands. They are known to perform such feats particularly when conditions are humid. 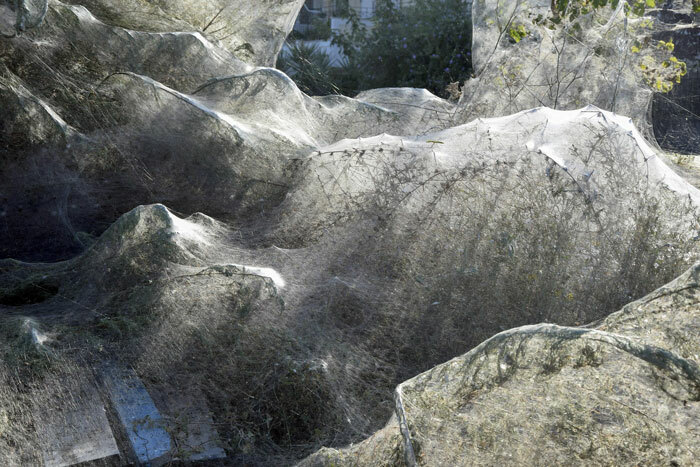 “It’s as if the spiders are taking advantage of these conditions and are having a kind of a party,” said Professor Maria Chatzaki from the Democritus University of Thrace in Komotini. Previous articleHow would YOU react to the discovery/reveal of alien life?